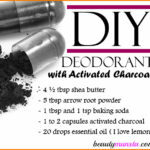 DIY Deodorant with Zinc Oxide | Sunscreen Deodorant Recipe - beautymunsta - free natural beauty hacks and more! 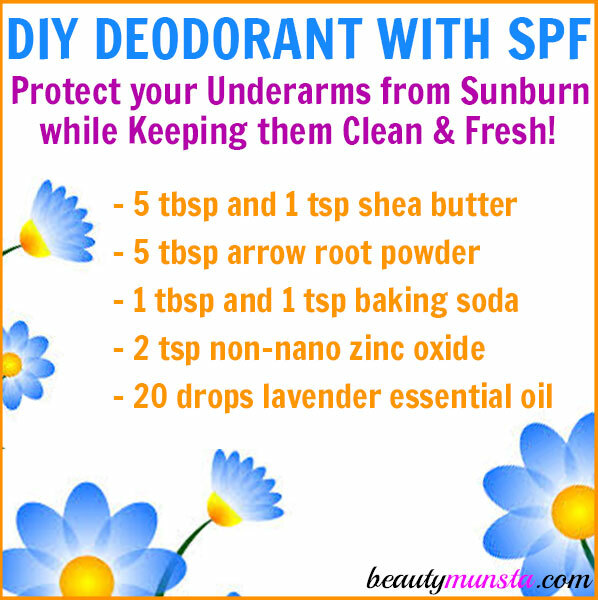 Make a DIY deodorant with zinc oxide to give your deodorant a sun blocking effect! 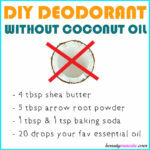 There are countless DIY deodorant recipes out there. 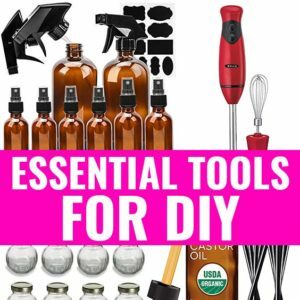 I personally have many on the blog using different ingredients my readers prefer to (or not to) use: there’s one without beeswax, without coconut oil, a spray deodorant, with Himalayan salt, a gel deodorant and one with activated charcoal. Just search for them in the search box at the bottom of this site, please! 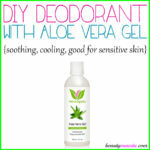 In this post, I’m sharing a DIY deodorant with zinc oxide. Why zinc oxide? Because it has sun-shielding abilities! If you’re using a deodorant for the summer, it’s useful to have one with sunscreen properties too, don’t you agree? So read on to find out how to make it! It’s really simple too! Place 5 tbsp and 1 tsp of shea butter in a small pan on the stove top. Gently melt it down over a low heat. Don’t turn up the heat because we don’t want the nutrients to be destroyed with high heat. Once melted, turn off the heat and add the baking soda, arrow root powder (or corn starch) and zinc oxide powder. Wear a mask over your nose to prevent inhaling the zinc oxide. Stir well to form a creamy paste then stir in the lavender essential oil. Instead of lavender, you can use any of your fav essential oils like ylang ylang oil, jasmine oil & frankincense oil. For summer, sandalwood oil or eucalyptus oil is perfect! Avoid citrus oils if you’re going to expose your skin to the sun. Pour your creamy mixture into deodorant tubes or a glass container. If using a plastic container, then first completely cool your deodorant for 10 minutes. It will become more firm but you can still scrape it into the container. That’s it! 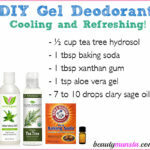 Your DIY deodorant with zinc oxide is ready! Let it set in the refrigerator for 30 minutes before use! If storing in a container, scoop out just a pea-sized amount each and apply on clean underarms. Reapply after swimming/sweating. If you stay out of the water, you might not need to reapply because this deodorant can last for very long! It’s very effective, folks!